All concerts begin at 8 PM on the second floor of Julia Morgan’s gorgeous Berkeley City Club. Be dazzled by this enchanting a cappella chorus! Enjoy the spellbinding virtuosity of this East Indian ensemble! 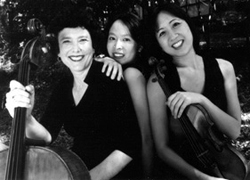 Don’t miss this award-winning piano trio—save the date! Relish the luscious sounds of this string quartet with mandolin! The clarity and musicianship of these woodwind players will astound! This astonishing 9-voice a cappella ensemble directed by Michael Senturia, performs classical repertoire from the Renaissance to contemporary and will be with us fresh from performances in Florence and Rome. Among other pieces, they will perform Orlando Di Lasso’s Tears of St. Peter. Join us for this incomparable experience! Alam Khan and his colleagues are musicians studying the classical Indian music tradition which is flourishing at the Ali Akbar Khan College of Music. 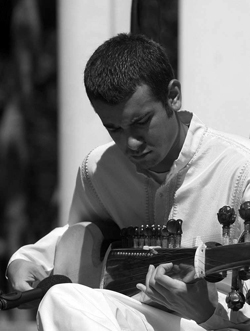 Alam plays the sarod, a teak “northern Indian lute” played using a coconut striker. Joining him will be the stellar musicians Debopriyo Sarkar on tabla and Manek Khan on tampura. This hypnotic music transports the listener to far-away lands. The New Pacific Trio, music professors at the University of the Pacific, offers playing that’s anything but academic. Their exhilarating accounts of repertoire from Romanticism to café music are intense and playful. One of our Board members heard this trio and insisted we couldn’t have our next season without them. We agreed, and invite you to join us as these ladies kick up their heels with Beethoven’s “Ghost” Trio, Shostakovich’s Op. 67, and a jazzy trio by Paul Schoenfeld. Friday 24 March 2006, 7:30 p.m. at a splendid private home in the Berkeley Hills (directions will be mailed after RSVP) for an evening of music, champagne, and dessert. If unable to attend, but you would like to support Berkeley Chamber Performances with a tax-deductible contribution, we would be glad to receive it. We hope you can join us there! 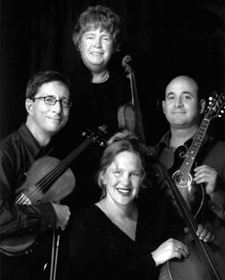 Featuring mandolin, violin, viola and cello, the Luna Nova Quartet instills the traditional quartet medium with a fresh instrumental voice. They infuse the classical quartet concept with contemporary energy and expression through imaginative arrangements. Come hear them perform lively and original interpretations of some of the great classical works by master composers, featuring tangos of Astor Piazzolla, one of the Bachianas Brasileiras of Villa-Lobos, Bartok’s Romanian Dances, and other works. 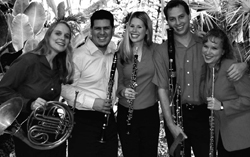 This newly-formed woodwind quintet has been described as the “next generation” of the San Francisco-based CITY WINDS. This evening’s repertoire includes Nielsen’s Quintet, the 6 Bagatelles of Gyorgy Ligeti, and Hindemith’s Kammermusik. This is innovative as well as traditional performance with brilliant precision and artistry. Don’t miss them!